Award Winning Children's Media from Classical FUN Music! The Classical FUN Sing-A-Longs CD / Book Set. Our symphonic quality music CD with superbly sung child centered lyrics brings learning to life! 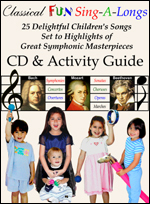 Our companion guide for teachers, parents and librarians describe appropriate activities for each song. Count in multiple languages to Mozart, dance with puppets to “The Blue Danube” or fly into space with Wagner! This imaginative music creates fun and memorable experiences for developing multiple intelligences! The CD contains lyrics and highlights from 25 masterpieces. Instrumental only versions with composer and title introductions provide college-level music knowledge! VOCALS BY DANIEL DEVICENTE AND JULIE PARSONS. LYRICS BY CLAIRE AND ROBERT FRANKI. Listen to Beethoven's "Fuer Elise"
The A to Z Symphony Video. Music Appreciation 101 - For Ages 0-5! “The A to Z Symphony” consists of 26 independent, one-minute videos set to the melodies of some of history’s greatest composers. Each letter's vignette is preceded by a written and spoken introduction of the title and composer of the music, so they become associated with the video, and memorized naturally by young minds! Video images were selected specifically to complement the mood of each masterpiece. Children will learn the music, and name titles by Bach, Mozart, Beethoven, Vivaldi and Tchaikovsky! 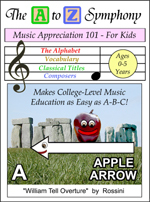 It's college-level music education - as easy as A-B-C! Watch Previews from "The A to Z Symphony"
Watch embedded YouTube Previews of "The A to Z Symphony."